In May 1993, the Town of Valdese celebrated the centennial of the arrival of its original Waldensian settlers in 1893. The settlers arrived by train on what was then the Richmond & Danville Railroad. The Norfolk Southern Railroad, current operator of the line, brought a commemorative train to Valdese as a part of the celebration pulled by Norfolk & Western Class J 4-8-4 steam locomotive #611. #611 was taken out of service the following year and now is on display at the Virginia Museum of Transportation. 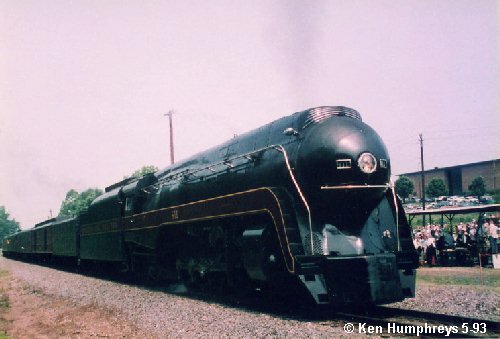 The three pictures below show #611 at Valdese in May 1993. Click on each image to see its full sized version. Hit your back button to return and view the next photo. 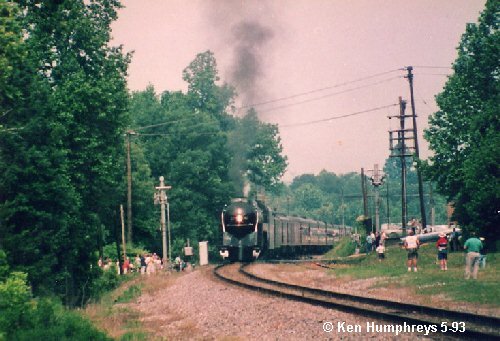 The Valdese Centennial train arriving, May 1993. Locomotive #611 and her train at Valdese. 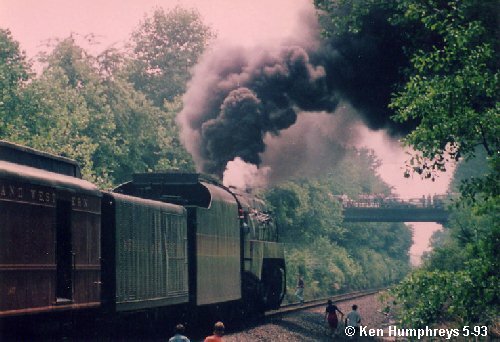 The Centennial train departs under full steam.